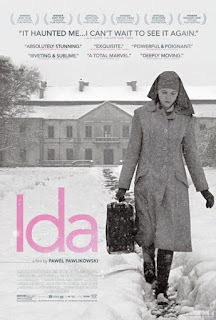 With a nod to Roy Gardiner for his post about the work of Pawel Pawlikowski (https://goo.gl/iSJ1Rz) I can add that this, his 2013 film, is certainly also worthy of note. It's a harrowing tale set in 1960's Poland, bleak and resource-stricken following the aftermath of WWII, by which time many other countries were on the road to some recovery. This seems to be Pawlikowski's hunting ground and his work clearly enables pause for reflection. Purposeful use of black and white and near-4:3 adds hugely to the atmosphere, era and setting. During the war, Anna had survived as a toddler, whilst her parents and brother did not. The family was Jewish and Anna was sneaked off to a local convent to be successfully hidden from the Germans. Back to the 1960's and Anna is shortly to take her vows and become a nun. Before she does so, Mother Superior feels that she needs to give closure to the plight of her family and sends her off to her only known living relative - an aunt in a nearby town - to try and find out what happened to them. The pair set off together to track down what they can. Turns out that the aunt is a depressed alcoholic saddened by her situation following previous professional high-standing and achievement as a lawyer. She's now a judge, but she has lost hope. It's a sad story of abandonment, poverty, tragedy, the struggle between religion and war, reflection of purpose and futility, choices and life's meaning - as the two leads try to find some, amongst the bleakness. The two are played by the relatively well known and experienced in European cinema's Agata Kulesza and the pretty much unknown Agata Trzebuchowska. The latter plays Anna perfectly as she struggles with this plight, demonstrating a commanding ability within this difficult role. She draws the viewer in beautifully and enables an empathy which the audience could well have missed out on. The story, however, gives way to the production. This, though, is a work of art with sumptuous visual engagement - and quite brilliantly perceived and executed photography that only European cinema seems to be able to do quite so well. Every shot, every scene, is like a moving painting on canvas. The regular absence of dialogue in many films would be uncomfortable and feel out of place, whereas here, that yielding to visuals and art is excellently created when offered to the eye. Placing figures in the frame oddly for example, which, if you tried to describe the effect, would be difficult, but here - it just works. It's a masterpiece of creative film making and even if you don't fancy the story or setting, just try and see it for the art. Highly recommended - and I shall look forward to seeing Cold War very much.